I will confess to never having heard of Bel Ami either as a novel or a film before watching the trailer about a month ago. It wasn’t on my radar since I’m not in the Robert Pattinson fan club (nothing wrong with him but I don’t quite get the hysteria) but, because I rarely say no to free cinema tickets, I found myself at a preview last night. So, is it worth a look? 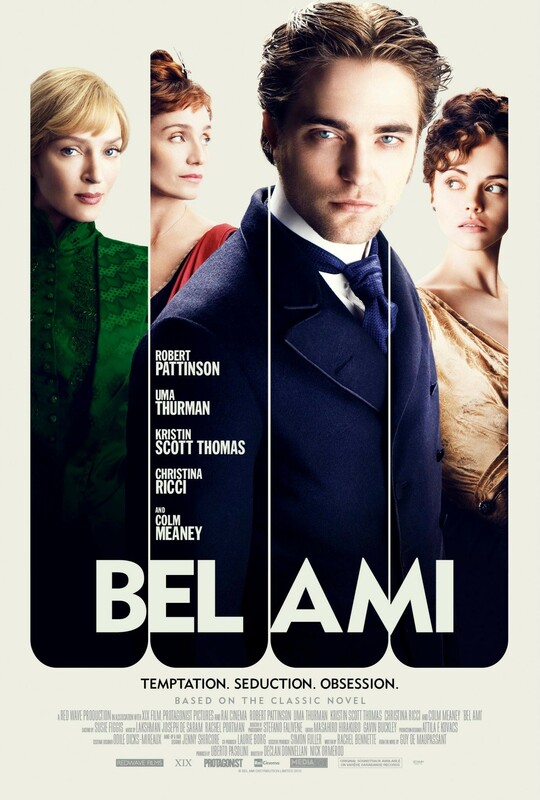 On the basis of cast alone, Bel Ami promises much – Pattinson is joined by Uma Thurman, Christina Ricci and Kristen Scott Thomas – yet I felt that it struggled to know what kind of film it was trying to be. It is certainly gorgeous to watch; I couldn’t fault the style or attention to detail, but the action itself unfolds sporadically, jerking from one storyline to the next without an overall sense of purpose. The setting in late 19th century Paris is ideal for what is essentially a ‘rags to riches’ story and the film is perhaps strongest when giving a sense of the wider context in which Pattinson’s character is operating. He is ambitious, amoral and ruthless, playing a dangerous game with the affections of a trio of high society women. This is conveyed mainly through steely looks and close-ups of his famously wolfish mouth rather than through dialogue, so we are left to surmise his motivations and consequently never get close enough to know his true character. I should also mention the score, which although suitably dramatic, is perhaps a bit heavy handed at times. And the accents. Although set in Paris, the cast have adopted upper class English as a default, although Thurman does go for a throaty French caricature in parts. I mention it, not to criticise for its own sake, but because I found it distracting after a while. So, whilst I hate to be negative, this one was a little disappointing, perhaps because I was expecting more. A little too messy and inconsistent, although I’d love to hear from anyone who has read the book and can give that kind of perspective on it.